Tumor necrosis factor (TNF) and lymphotoxin-alpha (LT-alpha, also known as TNF−beta) are members of a family of secreted and cell surface cytokines that participate in the regulation of immune and inflammatory responses. LT-beta (lymphotaxin-beta or tumor necrosis factor C) is a type II membrane protein with significant homology to TNF, LT-alpha, and the ligand for the CD40 receptor. LT-alpha is present on the surface of activated T, B, and LAK cells as a complex with the 33 kda glycoprotein, LT-beta. LT-beta, also expressed by active lymphocytes, forms a heterotrimer with LT-a on the cell surface and anchors LT-alpha to the cell surface. A TNF receptor-related protein, the LT-beta receptor (also known as TNFC receptor), is the human receptor for the LT-alpha/LT-beta heterotrimer. There are two LT-beta isoforms expressed in human lymphoid cell lines and non-Hodgkin's lymphomas. The gene which encodes LT-beta maps to the major histocompatibility complex region on human chromosome 6p21.3. 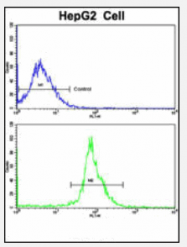 Western blot (WB) analysis of LT-β antibody (Cat.-No. : AP06717PU-N) in extracts from HepG2 cells. 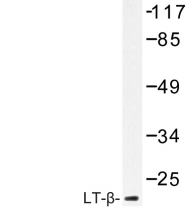 Western Blot analysis of LTA expression in transfected 293T cell line (H00004049-T01) by LTA MaxPab polyclonal antibody.Lane 1: LTA transfected lysate(22.30 KDa).Lane 2: Non-transfected lysate. 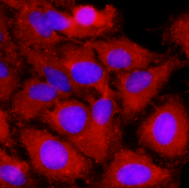 Formalin-fixed and paraffin-embedded human hepatocarcinoma reacted with LTA Antibody (Center), which was peroxidase-conjugated to the secondary antibody, followed by DAB staining. Western blot analysis of LTA Antibody (Center) (AP17540PU-N) in MDA-MB231 cell line lysates (35ug/lane). LTA (arrow) was detected using the purified Pab. Flow Cytometric analysis of HepG2 cells using LTA Antibody (Center)(bottom histogram) compared to a negative control cell (top histogram). FITC-conjugated Goat-anti-Rabbit secondary antibodies were used for the analysis. Immunofluorescence of human HeLa cells stained with monoclonal anti-human LTA antibody (1:500) with Texas Red (Red). Nucleus was stained by Hoechst 33342 (Blue). 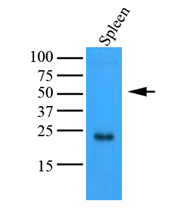 Western blot analysis: Tissue lysates of mouse spleen (35 ug) were resolved by SDS-PAGE, transferred to NC membrane and probed with anti-human LTA (1:1000). Proteins were visualized using a goat anti-mouse secondary antibody conjugated to HRP and an ECL detection system. Western blot analysis of TNF-β antibody (Cat.-No. : AP20614PU-N) in extracts from COS-7cells. 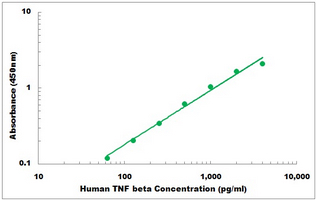 Western blot (WB) analysis of TNF-beta antibody (Cat.-No. 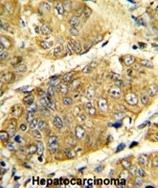 : AP20614PU-N) in extracts from COS-7cells. Western blot analysis of TNF beta expression in HeLa (A); Human tonsil (B); Human lymph node (C) whole cell lysates. 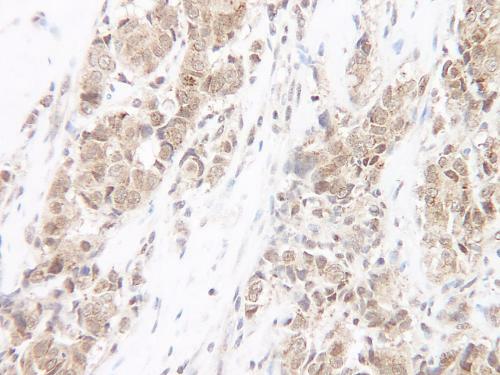 IHC of human breast malignant carcinoma. The recommended concentration is 0.50 ug/mL with an overnight incubation at 4.C. An HRP-labeled polymer detection system was used with a DAB chromogen. Heat induced antigen retrieval with a pH 6.0 sodium citrate buffer is recommended. Optimal concentrations and conditions may vary. Tissue samples were provided by the Cooperative Human Tissue Network, which is funded by the National Cancer Institute. 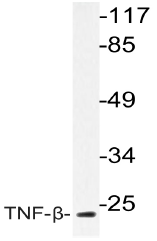 Recombinant protein of human lymphotoxin alpha (TNF superfamily, member 1) (LTA), transcript variant 1. Preparation: or Add: Recombint proteins was captured through anti-DDK affinity column followed by conventiol chromatography steps. 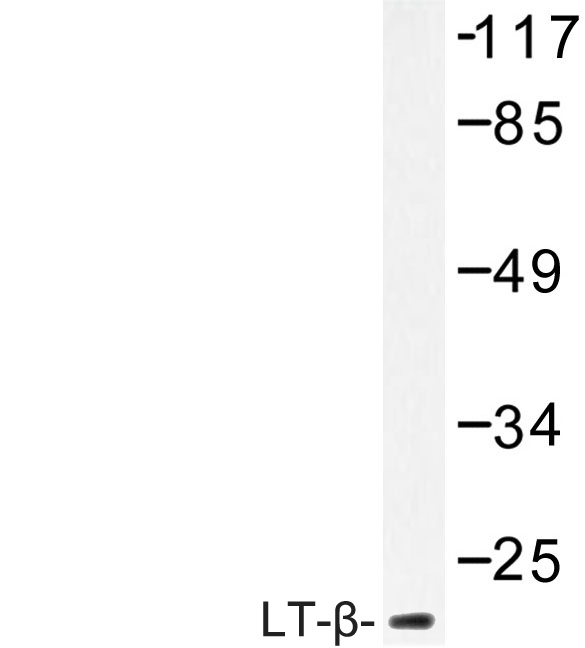 Purified recombinant protein of Human lymphotoxin alpha (TNF superfamily, member 1) (LTA), transcript variant 2. 25 products - FILTER YOUR RESULTS!